Restaurateur Ralph Brennan has breathed new life into an old favorite. 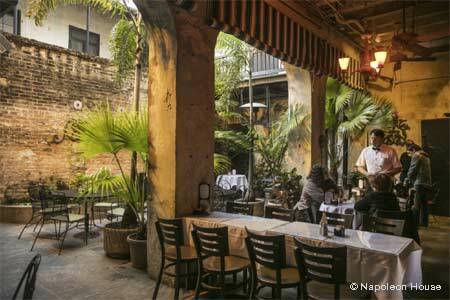 : Restaurateur Ralph Brennan (Ralph’s on the Park, Redfish Grill) bought Napoleon House. Since the place has been open for more than a century, Brennan wisely kept the traditional ambience intact, including the beautiful, old wooden bar, the weathered walls, simple wooden tables and chairs, and the cozy courtyard, which now features tables draped in white linen. Chef Chris Montero, formerly of Brennan’s Café B, offers a menu of local favorites such as red beans and rice, po’ boys (try the roasted pulled duck), sandwiches including a standout curried chicken salad, and desserts from the century-old Angelo Brocato (try the lemon ice). Many people go to Napoleon House just for the cocktails, like the famous Pimm’s Cup. The limited wine list focuses on Italian and California varieties. Upstairs are elegant private party rooms that overlook one of the busiest intersections in the French Quarter.